Welcome to 2018! We're back for the first Buffy rewatch post of the year. And, for you Oz fans out there, it's time to celebrate yet again. 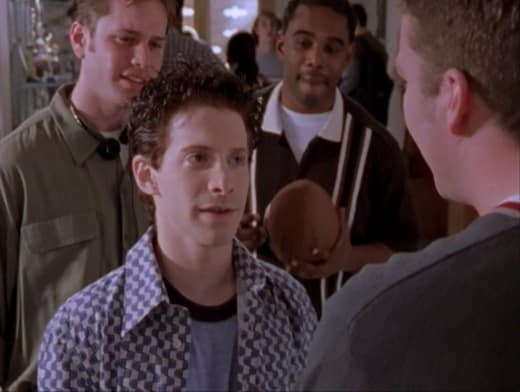 Buffy the Vampire Slayer Season 2 Episode 15 had it all for the mellow fellow. Plot, relationship, and his wolfy tenancies became part of the show. "Phases" is not my favorite episode; however, it serves a much-needed purpose for the Scoobies. Let's find out why by rewatching "Phases." Before we get into the thick of things with Buffy the Vampire Slayer Season 2 Episode 15, let's take a second to acknowledge the past. We finally saw the cheerleading trophy again! 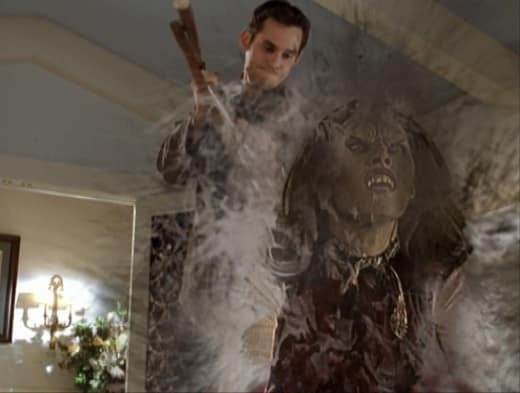 For those who need a refresher, Amy's mother (the villain of Buffy the Vampire Slayer Season 1 Episode 3) got trapped in the trophy after a spell went awry. No one knows she's in there; she's just trapped. This was the perfect twist that left my jaw dropped the first time I watched it. I love seeing these subtle nods to past plots pop up in the series. It ties together both the serialized and episodic nature of Buffy the Vampire Slayer for a well-connected story. Plus, the moving eyes that pulled Oz in were a nice touch. Oz and Willow having relationship woes isn't surprising. Oz wanted to take things slow while Willow was still conflicted over her feelings for Xander. It was a classic case of a recipe for disaster. Though, my frustration with the Oz character by the time of "Phases" is that Willow has been clearly making an effort to prove her feelings to him. Their entire opening conversation about their previous date was hard to watch. She showed that she liked him and made an effort, but he gave her nothing. To the outsider new to Buffy the Vampire Slayer, it seemed like they had no chemistry. We obviously know this wasn't the case, but it was an unsatisfying scene. Thankfully Buffy and Larry got any thoughts out of them about their interest for each other. Willow: Nowhere! I mean, he said he was gonna wait until I was ready. I’m ready. Honest! I’m good to go here. Buffy: I think it’s nice that he’s not just being an animal. Willow: Maybe, it is nice. He’s great. We have a lot of fun...but I want smoochies! Buffy: Have you dropped any hints? 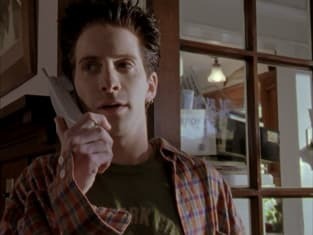 Buffy: He’ll come around. No guy can resist your wily Willow charms. Willow: At last count...all of them, maybe more. Permalink: No guy can resist your wily Willow charms. I'm going to ignore Xander's sudden interest in Willow's dating life. It felt out of place, especially since Xander had made peace with Willow after being caught. This 'boys with toys' trope was so overdone. He was already seeing Cordelia, and Willow was hanging out with a new guy. He had no reason to be jealous of Oz. I love horror movies; it's no secret. 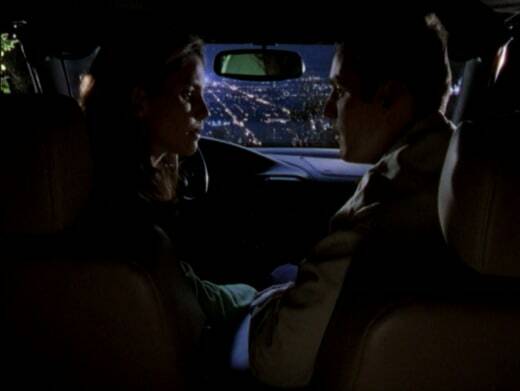 As a fan of the genre, the scene of Cordelia and Xander making out in the parked car reminded me so much of retro urban legends and horror movies. It was perfect and suited the horror side of the series. The wolf attacking the car was expected. A lot of focus was placed on this location and when you're in Sunnydale, a demon or creature attack was bound to happen. Being alone together in a car at the traditional lover's lane was begging for a monster attack. I was surprised, on the other hand, when the werewolf punched through the car's roof. This is going to be a common theme for Buffy the Vampire Slayer Season 2 Episode 15 as you rewatch. The werewolf is clearly capable and intelligent enough to make decisions when attacking and chasing targets. Xander: What could she possibly see in him? Cordelia: Excuse me?! We didn’t come here to talk about Willow. We came here to do things I can never tell my father about because he stills thinks I’m a...good girl. Xander: I just don't trust Oz with her. I mean, he's a senior. He's attractive. Okay, maybe not to me, but...and he's in a band. And we know what kind of element that attracts. Cordelia: I've dated lots of guys in bands. Permalink: I've dated lots of guys in bands. Buffy flipping Larry after he touched her was my favorite comedic gag of "Phases." After he was being a pig (again) and underestimating Buffy (again! ), he finally got a swift kick of karma. It's a shame he didn't get flipped for every time he treated someone bad, especially after his words to Theresa. Though, it was one thing simply to get flipped, but the look Willow gave Buffy sealed the entire scene as iconic. You could tell from her expression on Willow's face that she couldn't believe Buffy wouldn't pretend, or play nice, even for a little bit. It's a look we've all given that one friend every now and then. I'm happy that the Monster of the Week was easily identified. Sometimes we spend a lot of time with the Scoobies researching until they miraculously figure out the random demon. This was quick, painless and right to the point. Come on, how could you not tell it was a werewolf? Larry was the obvious red-herring. The bite mark and bandage on his arm might as well have had a glowing red 'X' on it to divert attention. It wasn't going to be him. Buffy: So, what’s the word? Giles: It seems there were several other attacks by a wild dog around town. Several animal carcasses were found mutilated. Willow: You mean like bunnies and stuff? No, don't tell me. Oz: Oh, don't worry. I mean, they might not look it, but bunnies can really take care of themselves. Permalink: Oh, don't worry. I mean, they might not look it, but bunnies can really take care of themselves. This next fact isn't really surprising: I hate Cain. He's a terrible antagonist and he's painfully dull. One of the problems of Buffy the Vampire Slayer Season 2 Episode 15 was that it didn't have a defined villain. We had the werewolf (but he wasn't a bad guy), and we had Cain (but he was simply a neutral inconvenience). The Scoobies were already trying to stop and save the werewolf, but once the identity was revealed, that focus was pushed more so. Cain only served the plot to be an added bump in the road to stop the werewolf. 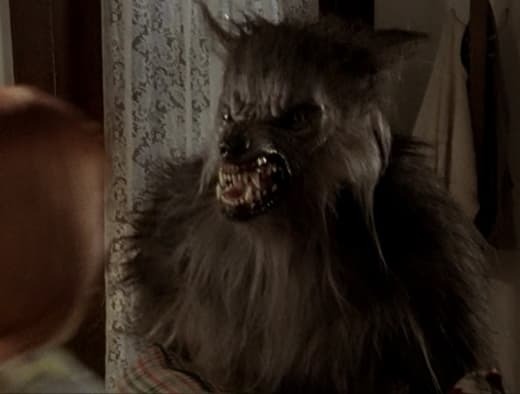 The design of the werewolf looked very much like a costume. Like, if we went down to any costume shop, we could probably find something similar. It's a shame that the wolf broke up Cordelia and Willow's bonding time at The Bronze. They were finally reaching common ground and venting about the two people who weren't getting their acts together. 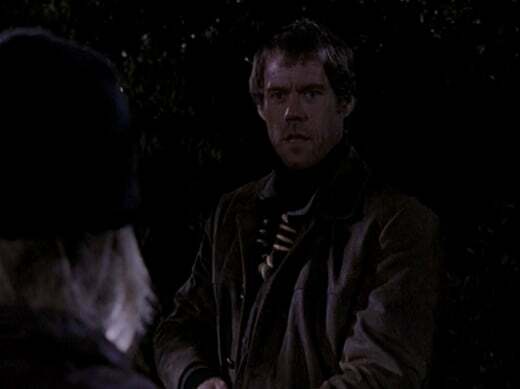 Giles: The werewolf, uh, is such a potent, extreme representation of our inborn, animalistic traits that it emerges for three full consecutive nights: the full moon, and uh, the two nights surrounding it. Willow: Quite the party animal. Giles: Quite. And it, uh, acts on pure instinct, no conscience, predatory and aggressive. Xander: On behalf of my gender...hey! Giles: Yes, let’s not jump to any conclusions. Buffy: I didn’t jump I took a tiny step and there conclusions were. Permalink: Quite the party animal. Why did Oz not panic after finding out he was a werewolf?! I will never understand this. Don't get me wrong, he had shown that he's a calm guy who processes these surprises quickly. We even saw him taking the news of vampires being real on Buffy the Vampire Slayer Season 2 Episode 13 pretty well. However, this curse affected HIM. He took waking up in the woods naked calmly. He barely batted an eyelash when he discovered his cousin infected him. He didn't even seem worried at all in the lead up to his visit to the library. His reaction to this news has always irritated me. This didn't feel like a natural human response to a traumatic event. I'm on the fence about Xander's reaction to Larry's secret too. He was too uncomfortable and dramatic about being a witness to Larry's coming out. Though, this could simply be due to a case of time capsule. Buffy the Vampire Slayer Season 2 Episode 15 came out in 1998, which was at a different point with LGBT characters than what we have now. Sometimes we forget the lens of watching it then vs. rewatching it nowadays; that might be the case here. On the other hand, Xander is still the worst. Poor Theresa. She was a sweet girl killed simply to be a messenger for Angel. Though, did Angel choose her out specifically? I wondered if he knew Theresa was friends with Buffy or if he simply guessed that she might know of her. "Phases" was the first time we saw Theresa, so there's no past information if Angel was aware of this character's history to Buffy. We're only left to guess here. Still, the staking of Theresa is hands-down one of my favorite vampire vanquishes in Buffy the Vampire Slayer history. Oz turning into the werewolf felt very Teen Wolf. (The 1980's movie, not the TV show.) We saw what must've been a painful transformation moment be heavily mixed with teen couple drama. I liked seeing the progression of his transformation into the wolf. It highlighted every grueling step, and the special effects were very well done to illustrate the stages between man and wolf. Though, as I mentioned above, the end product of the wolf was less than to be desired. How Willow was able to outrun a werewolf...I will never know. If we're debating any confusing elements of Buffy the Vampire Slayer Slayer Season 2 Episode 15, that might be one of them. Did you think Cain was going to kill Oz? I never thought it as a possibility. If we were going to lose Oz, it would've been in a more climactic way. In an episode like "Phases," the theme focused more on relationships and the group welcoming the inclusion of demonic friends into their circle. Oz was one of the first times where a close friend was connected to an evil entity, similar to Angel was before going full evil as Angelus. He was essential to their growth as well as his. Even if he was technically the MOTW, it served the plot better for him to stay alive and be saved than killed by a werewolf hunter. I thought that way when I was seven, and I still do. The final battle anticipation was lost since I expected him to survive regardless. Willow: I kinda thought you would’ve told me. Oz: I didn’t know what to say. It's not everyday that you find out that you're a werewolf. That's fairly freak-some. It may take a couple of days of getting used to. Willow: Yeah. It's a complication. Oz: Well, you know like...stayed out of your way for a while. Willow: I don't know. I'm kind of okay with you being in my life. Oz: You are quite a human. Willow: So, I'd still if you'd still. Oz: I'd still. I'd very still. Willow: Okay, no biting though. Oz: I’m a werewolf in love. Permalink: Okay, no biting though. After Buffy the Vampire Slayer Season 2 Episode 15, these two were finally open with each other and showed passion. Their relationship had new life as compared to the roadblocks they kept dealing with. And I'm glad they worked it out because it would've been uninteresting to follow their journey if the Xander problem kept coming up. However, what was with that ending line by Oz? What did you think of "Phases"? Would you have liked to see Cain again? Did Oz take his transformation news too calmly? Why did Angel go after Theresa?